This is a scalable context timeline. 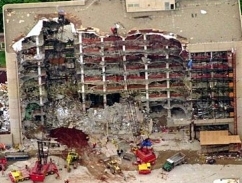 It contains events related to the event August 1994 - March 1995: BATF Informant Allegedly Warns Agents of Oklahoma City Bombing Plot. You can narrow or broaden the context of this timeline by adjusting the zoom level. The lower the scale, the more relevant the items on average will be, while the higher the scale, the less relevant the items, on average, will be. Mechanic Testifies to Seeing Five Men at Bomb Building Site - Charles Farley, a mechanic from Wakefield, Kansas, testifies that on April 18, 1995, around 6:00 p.m., he came across five men and four vehicles, including a large Ryder truck and a farm truck laden with bags of ammonium nitrate fertilizer, at Geary State Fishing Lake, near Herington, Kansas. Prosecutors believe that McVeigh and Nichols alone built the bomb at the state park sometime on the morning of April 18 (see 5:00 a.m. April 18, 1995 and 8:15 a.m. and After, April 18, 1995). Farley says he later saw one of the men, an older man with gray hair and a beard, on television. A photo of the man is shown to the jury, but the man is not identified. Sources say the man is the leader of a Kansas paramilitary group. BATF Informant Testifies - Carol Howe, a former informant for the Bureau of Alcohol, Tobacco and Firearms (BATF—see August 1994 - March 1995), then testifies, linking McVeigh to white supremacist Dennis Mahon and a group of Christian Identity supremacists living at Elohim City, Oklahoma (see (April 1) - April 18, 1995). Howe says in the spring of 1994, Mahon took a call from a man he identified as “Tim Tuttle,” a known alias of McVeigh’s (see October 12, 1993 - January 1994). Howe says she never told BATF or any other federal agents about the conversation because she did not know “Tuttle” was McVeigh. Howe also says she saw McVeigh at Elohim City in July 1994, in the company of two Elohim City residents, Peter Ward and Andreas Strassmeir. She says at the time she did not know McVeigh. After the bombing, Howe testifies, she told FBI investigators that Ward and his brother might be “John Doe No. 1 and No. 2,” the suspects portrayed in composite sketches circulated in the days after the bombing (see April 20, 1995). She testifies that in the days following the bombing, BATF agents showed her a videotape of McVeigh, and she told the agents she had seen McVeigh at a Ku Klux Klan rally. White Supremacist Settlement Resident Testifies about Phone Call - Joan Millar, the daughter-in-law of Elohim City religious leader Robert Millar, testifies that on April 5, 1995, she believes she spoke to McVeigh on the telephone. Phone records show that McVeigh called a number in Elohim City on that date (see April 5, 1995). “When I answered the phone, it was a male voice,” she says. “He gave a name, but it wasn’t ‘McVeigh.’ He said that he had—he would be in the area within the next couple weeks and he wanted to know if he could come and visit Elohim City.” She says the caller was reluctant to explain how he knew of the settlement, then says he met some residents at a gun show. A man with “a very broad foreign accent” had given him a card with a telephone number on it, she says he told her. She asked if he had spoken to “Andy,” meaning Strassmeir, and the caller said that may be correct. Millar says the caller told her he would call again for directions, but never called back and never came to the settlement. Millar says that while Elohim City residents were angry and worried about the federal assault on the Branch Davidian compound outside of Waco, Texas (see April 19, 1993 and April 19, 1993 and After), they planned no retaliation. Howe, however, testifies that she heard Strassmeir, Mahon, and Robert Millar advocate some sort of direct action against the federal government. Prosecutors have always maintained that Nichols and McVeigh bombed the Murrah Federal Building in Oklahoma City to avenge the people who died at the Branch Davidian compound. Cross-Examination Damaging to Defense Portrayal - Lead defense attorney Michael Tigar asserts that Marife Nichols’s testimony shows that “Terry Nichols was building a life, not a bomb.” However, under cross-examination, prosecutors quickly elicit details about the Nichols’s marriage that shows the two as distant and estranged, casting a new light on Marife Nichols’s attempt to portray their relationship as close and loving. She admits that for much of their seven-year marriage, they lived apart from one another, with her returning frequently to her home in the Philippines. She also admits that Nichols lied to her about breaking off his relationship with McVeigh, and that she suspected her husband was living a “secret life” that included numerous aliases and secret storage lockers, though she says as far as she knows, McVeigh was never in their home. She responds to questions about her husband’s shadowy activities by saying: “I don’t know. I didn’t ask him.” She recalls finding a letter to Nichols from McVeigh the week before the bombing, and though she says she did not understand the letter entirely, she remembers some phrases, including “shake and bake” and “needed an excuse for your second half.” US Attorney Patrick M. Ryan shows her a pink receipt found in the Nichols home for a ton of ammonium nitrate that prosecutors say was used to make the bomb, a receipt made out to “Mike Havens,” an alias used by Nichols to buy the fertilizer (see September 22, 1994 and September 30, 1994). The receipt was wrapped around gold coins found at the back of her kitchen drawer; federal analysts found McVeigh’s fingerprints on the receipt. Ryan places two gold coins on the receipt, fitting them precisely into two dark impressions left on the receipt, presumably by the coins. The coins belong to Nichols, and may have come from a robbery Nichols perpetrated to help finance the bombing (see November 17-18, 1997). On April 16, she says, Nichols told her he was going to Omaha, Nebraska, to pick up McVeigh, when in reality he went to Oklahoma City (see April 16-17, 1995). Prosecutors have said that Nichols helped McVeigh stash the getaway car to be used on April 19 after the bomb was detonated (see April 13, 1995). He admitted lying to her about the April 16 trip just seconds before turning himself in on April 21, she says. She admits that Nichols had used a mail-order bride service to find her, and says he once told her, “Young ones were easier to train.” Marife Nichols was 17 when she married Nichols in November 1990; after they married in Cebu City, Philippines, he left her there and returned to the US without her, only bringing her to America months later. She says that she could not remember the exact date of their wedding. She also admits that when she joined Nichols in July 1991, she was pregnant with another man’s child. That child was found in 1993 dead with a plastic bag wrapped around his head; his death was ruled an accident. The two have two more children together. She is unable to offer an alibi for Nichols’s whereabouts on the morning of April 18, when prosecutors say he helped McVeigh construct the bomb. In saying she knew nothing about the storage lockers rented under aliases, she seems to contradict Tigar’s previous assertions that the storage lockers were used for storing innocent items and Nichols chose to use aliases merely to avoid creditors (see November 3, 1997). She also contradicts Nichols’s statements to the FBI that he had not seen McVeigh for months before the bombing. Defense Rests - After Marife Nichols’s testimony concludes, the defense rests. The Post observes: “The defense’s eight-day case was aimed at generating confusion among jurors by poking holes in the government’s scenario, with the specter of additional accomplices and a second Ryder truck. At times, it seemed like the defense was trying to put the mysterious suspect John Doe No. 2—who was never identified and never found—on trial, instead of Nichols.” Nichols does not testify in his own defense.